Let's dedicate this thread exclusively to talk about everything concerning the armor protection of the British battleship Vanguard (1946-1960). If we have a good discussion we may open similar threads on other warships. I am attaching some drawings as a starting point, then it is all up to you. Now, what do you think about the protection scheme of the Vanguard? Next week I´ll look what Raven and Roberts had over this ship. Also with Friedman which I have with me. I am not an expert but I don´t like the armoured deck seated on TOP of the belt, it is exposed to incoming shells. I would prefer the belt reaching one deck up and the armoured deck being one deck down. But sure there is some good thing in the used scheme, so I will listen to the experts. Vanguard has a huge percentage of protected volume, probably more than any modern non-British ship. I don't mind the relatively exposed conning position. Commanders didn't seem enthusiastic about using the heavier armor in US ships, so what good was it? Protection for the steering gear isn't so good. Maybe the barbettes could use some beefing up. Splinter protection is a bit more realistic than in KGV. Tiornu, what about the underwater protection and how it did differ from previous designs? Compared to KGV, Vanguard's TDS extended one deck level higher behind the belt. You can see this pretty clearly in cross sections of the two ships. 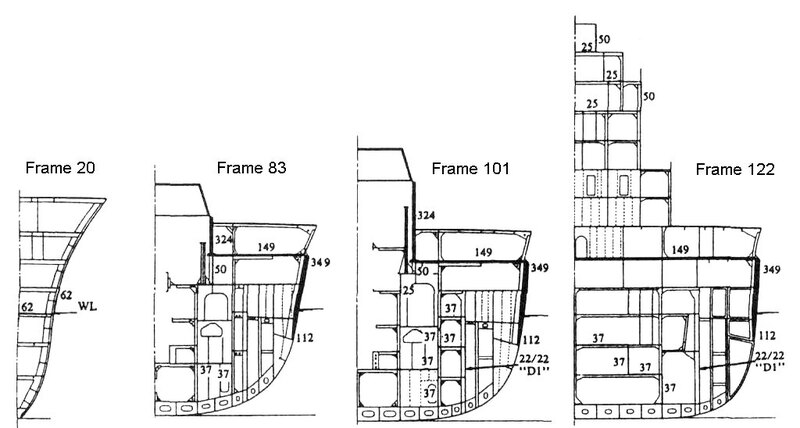 Vanguard's system was also deeper, 15 feet at half-draft amidships as opposed to 13 feet. I believe the Vanguard torpedo bulkhead wa 22 + 22mm thick for its whole length while KGV has some 19 + 19mm sections. Both ships shared an unfortunate discontinuity in the bulkhead near the aft barbettes. But in general Vanguard, was definitely better off than KGV. I think the main drawback to Vanguard's armour was the extreme length of the belt due to the 4 main turret design. A 3 main turret design would probably have allowed the main belt to be an inch or two thicker. Thanks to José I had to stop my reading on Friedman and pick up Raven & Robert`s "British Battleships" to learn about Vanguard. And, I must admitt, I`m begining to fall in love with this ship. Beautiful in a Hood way. The Naval Staff knew that new 16" guns would be the critical path (in the building program) to have new ships ready. They expected them to be ready at the end of 1944 or early 1945. But they had in store 4 15-inch twin turrets from the Courageous and Glorious. Modernized they expected them to had some 25 more years. The ship that would carry them, in the Memo, was estimated to be 40,000 tons and 30 knots without making any subtancial sacrifice in protection and would be a fully "armoured battlecruiser". (This is interesting because Vanguard would reach 30,3 knots with "just" 132,950 SHP whilst other contemporary new designs needed in excess of 200,000 SHP to reach similar speeds). The protection was similar to the King George V except Vanguard had a thinner main belt and the splinter protection was more extensive. The 14 inch belt armour was capable of withstand a 15 inch AP shell up to 15,000 yards. The splinter protection was modified after Bismarck and PoW action at DS. Then, at that glorious episode Bismarck`s 15" did penetrated PoW below the belt but didn`t explode. So, in order to prevent splinters from such a hit, penetrating the magazines (A-ha-ha! ) 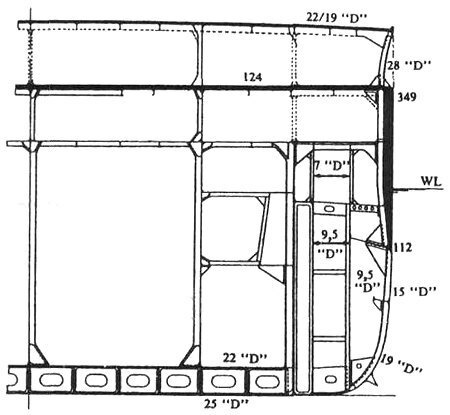 it was approved, on August 15, 1941, to fit a 1 1/2" inch NC armour to the longitudinal bulkheads of the main and secondary magazines in several British ships: Vanguard, DoY, Anson and Howe (It`s interesting to research if such a provision was taken in other allied ships). That increased weight in 80 tons. Another provision was taken fto prevent loss of buoyancy and water-plane area, forward and aft the citadel, as a result from splinter damage. So they added a 2 1/2" inch and 2 inch NC armour to the ship`s side, between lower and middle decks, forward and aft of the main belt extensions, and a 1 inch bulkheads within this area. This "gave protection against bombs or shells exploding on the armoured-deck and rupture of the ship`s unarmoured structure above, by blast and splinters." For underwater protection the system was similar to KGV Class, but as a result from PoW`s sinking the designers decided to increase the height of the longitudinal bulkheads "that formed the three groups of compartments outboard of the protective bulkhead. Thus, instead of terminating at lower-deck level, they were extended up to the middle-deck, and provided greatly improved su-division behind the armour near the waterline." So far, this is the information that regards the armour of this incredible and beautiful vessel, the last BB ever built. Beautiful in a Hood way. I like to think of Hood and Vanguard operating as a battleship division together. That would have been sweet. They would have been greater than the sum of the parts: awesone! Maybe the barbettes could use some beefing up. Didnt the QE's have thin barbettes too? I believe the QE's and R's both had 10in barbettes, and that was the thick portion. All US battleships from North Carolina on had 1.5 to 2 or more inch internal armor protecting magazines. On NC the 2" armor was between the magazine and the rest of the ship, and the layout of the other new battleships was similar. I assume that internal armour (1,5" - 2") is, really splinter armor. Am I mistaken? Yes, I think it's STS, the same stuff used on the outer hull. I don't know for sure, but that is my assumption. I believe my source refers to it as "armor", LOL.